In this blog I would like to focus on Estimated Breeding Values (EBV’s) and why are they so important. In particular, how can EBVs be used to help pick which animals to buy in order to build or improve one’s herd. The main point I would like to make is that EBVs supply crucial decision-making information to a buyer, but they are only as useful as the data used to calculate them. It is important to bear in mind that the EBVs published in an auction catalogue do not indicate whether the breeder participates in the National Beef recording and Improvement scheme or how accurate the particular set of EBVs are (i.e. what data on the individual animal has actually been captured rather than inferred). As you will see below, we are doing everything we can at Vastrap to make sure the EBVs in our sale catalogue are meaningful and can be used as an extra tool to select the right animal for your herd. Basically, when one buys a stud animal, there are three ways in which to judge the potential value of that animal to your stud. Firstly, one can look at the parentage or genotype (hence the importance of doing proper DNA parentage verification see The importance of parentage verification through DNA testing), secondly one can look at build or phenotype and lastly one can use EBVs. In rare cases one is able to look at progeny when buying older animals. While parentage and sound functional physical attributes like muscling, leg structure, udder conformation and teat quality will always play a very important role, EBV’s can be used to complement visual screening to select animals. There are several individual EBV’s that allow a breeder to come to an informed decision about what the animal in question can offer the breeder beyond good looks. All EBV’s are expressed as an index where 100 is the average. Where an animal’s index is below 100, then it has faired poorer than the breed average, while an index above 100 means it has faired better. I will briefly discuss the individual EBVs below. 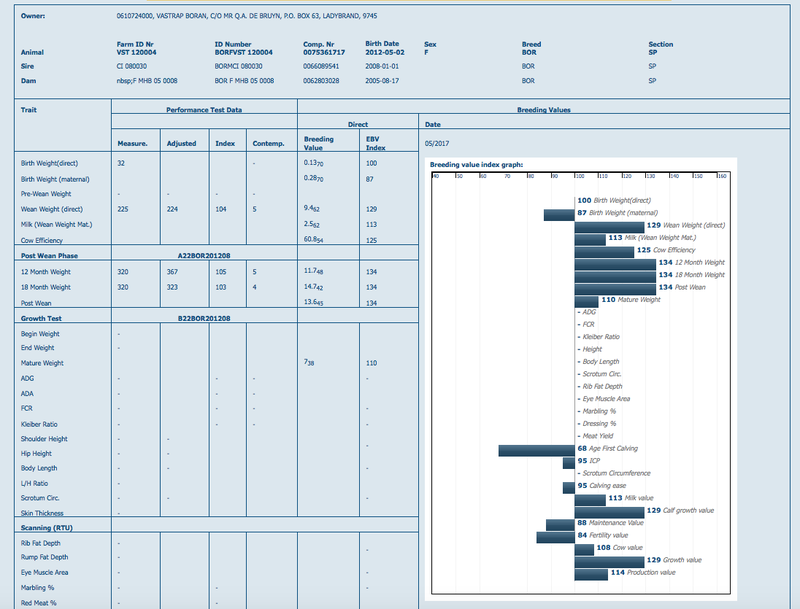 Calf Growth and Milk EBVs – These values are calculated using the data gathered from wean weights, the mother’s weight at weaning, 12 month weights and 18 month weights as well as the phase-D growth performance testing of bulls which is more accurate than just 12 and 18 month weights and also includes other important data points. Generally a growth and milk index above 100 is very desirable, though like all things in life some balance must be kept. Milk and fertility generally have an inverse relationship and so does growth and calving ease. If one were predominantly a weaner producer, then one would want higher milk and higher growth. Fertility EBV – The fertility EBV is made of two sub components namely the age at first calf (AFC) and inter-calf period (ICP). Obviously, one wants an animal that has the ability to calve first amongst her peer group and that calves regularly, preferably once a year. An index above 100 is an indication that the animal is more fertile than the breed average and this is based on the past performance of the family members of the animal in question. Milk and fertility often are inversely correlated (the more cow gives to a calf the less likely she is to fall pregnant again), so while one wants the most fertile herd possible, one should avoid negatively influencing the herd milk values in this pursuit. Cow Weight EBV – The cow weight EBV is made up of the 18 month EBV and adult weight EBV. A heavier animal at 18 months and as an adult has an index of above 100, while smaller animals have indexes low 100. The combined indexes are then used to derive a cow maintenance index, which is inversely proportional to the cow weight indexes, since a smaller cow is deemed to have a lower maintenance value. In harsher environments one would want smaller cows to reduce the maintenance factor. Cow Value EBV – This is an accumulation of the individual EBV indexes and uses a formula using different weights of importance for the individual EBVs to give an indication of the value of the cow. Personally, I am of the opinion that individual breeders have different needs and therefore place different emphasis on individual EBVs. A breeder should rather look at the individual EBVs to see what is needed in their herd than to rely on a set formula that does not take into account different environments and individual preferences. Our main purpose in writing this blog is to underline the importance of thorough record keeping and the supply of accurate performance data to the National Beef recording and Improvement scheme. The EBVs supply crucial decision-making information to a buyer, but they are only as useful as the data used to calculate them. It is important to bear in mind that the EBVs published in an auction catalogue do not indicate whether the breeder participates in the beef improvement scheme or how accurate the particular set of EBVs are. One can only judge this by looking at the production data on Logix (Live Stock Information and Genetic Information Exchange) to see whether any weights have been captured. 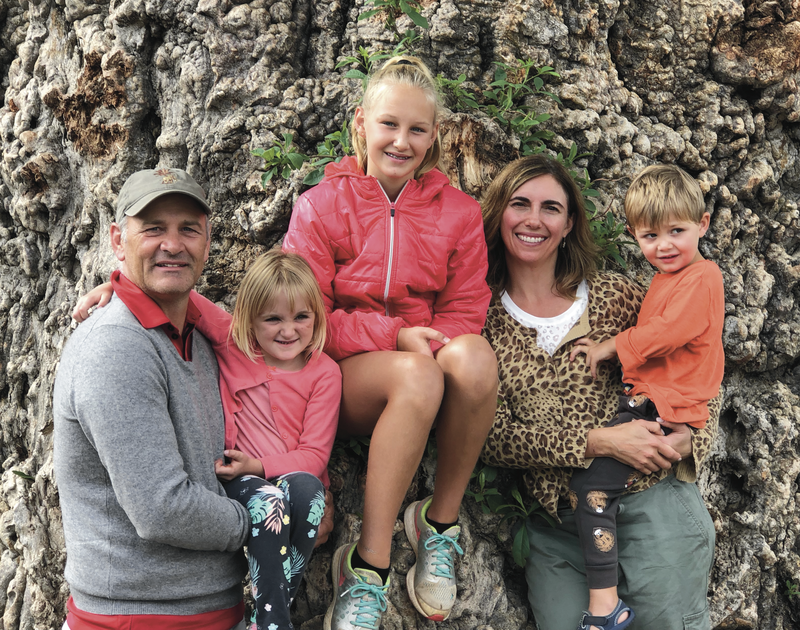 In the Boran industry, the number of breeders participating in the National Beef recording and Improvement Scheme and performance testing is still low. I am often disappointed to see that animals in which I have a strong interest at auctions do not have a single measured data point – no birth weight, no wean weight, no mother weight at weaning and certainly no 12 or 18 month weight. Without this data, no meaningful insight can be drawn about the potential future performance of the animal and one only has genetics and physical attributes on which to make a decision. Since buying the Mollshoop Boran stud in 2011, our policy at Vastrap Boran has been to collect as accurate data as possible on every single animal, including birth weight, wean weight and the mother’s weight at weaning. We also collect 12 month and 18 month weights. 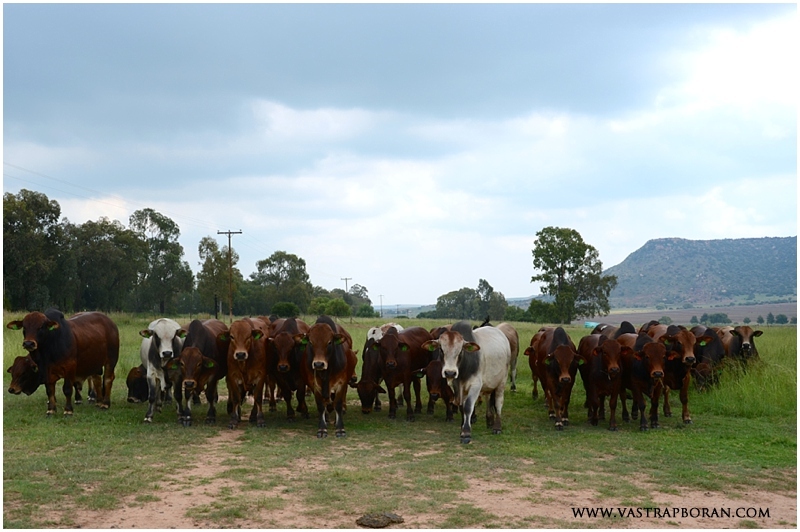 In addition, since 2011 Vastrap has put 95% of its bull calves through the Studbook administered phase-D veld performance test, which provides additional important information such as testes development, muscling, meat yield and marbling to name a few (see Bull Selection and Performance Testing). Vastrap alone has contributed over 35% of all the recorded phase-D bulls tested in the Boran stud industry. We can therefore assure you that the EBVs of Vastrap animals, even those older ones where their individual performance data was not measured, is as accurate as it can be. You can rely on the EBVs of Vastrap animals published in the Vastrap Auction sale catalogue and these EBV will provide you with an extra tool to assess the animals you like, over and above build, looks and parentage. This should help you to make a more informed decision about which animals will fit into your herd. 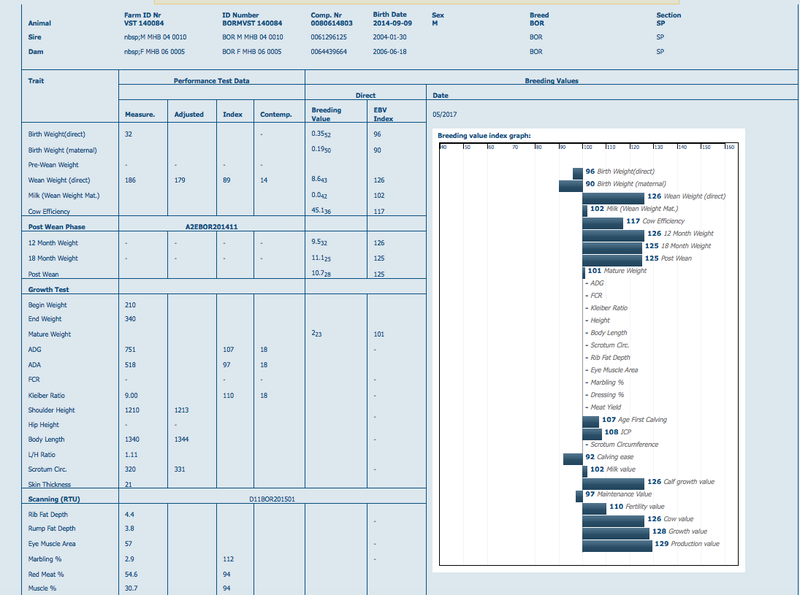 Below are examples of the production data and EVBs drawn from Logix for Jackie VST 12-04, and one of our three-year old bulls that went through performance testing VST 14-84. The first column of data shows all the data on the animal that has actually been measured. This data is important for the animal’s parents and their progeny, who will have EBVs based on the performance of their parents until they get their own data. 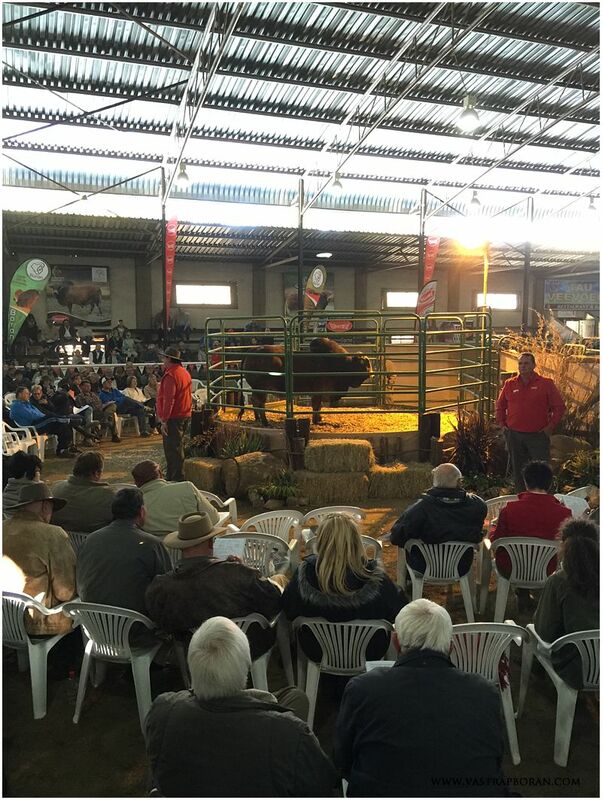 We had a fantastic time at the 2015 National Boran Auction last weekend that was held at the Afridome in Parys. It is always a real pleasure to catch up and socialise with our fellow breeders from around the country and to meet new people interested in the breed. The auction itself went very well. The top priced bull, Rupert LW 09-13, was sold for R230’000 to a Namibian breeder. 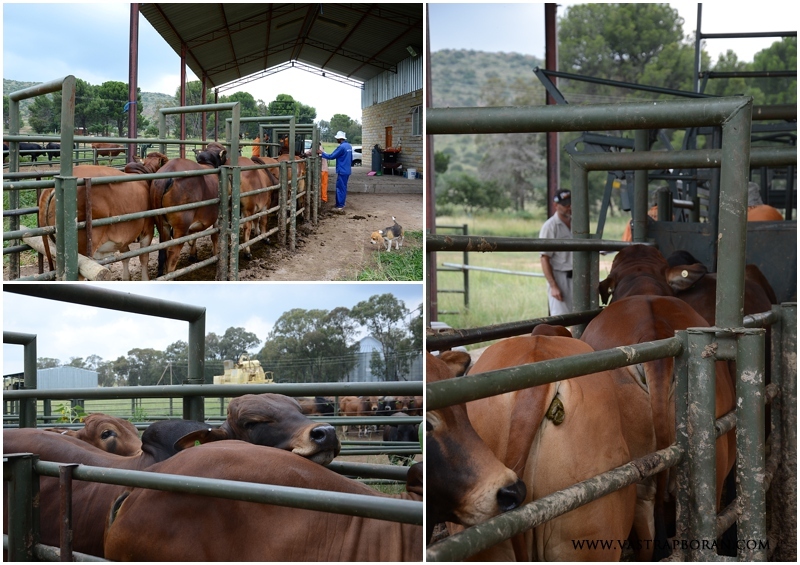 Several females, both cows and heifers went for between R60’000 and R85’000 with average prices in the range of R35’000 (see Latest Auction Results). 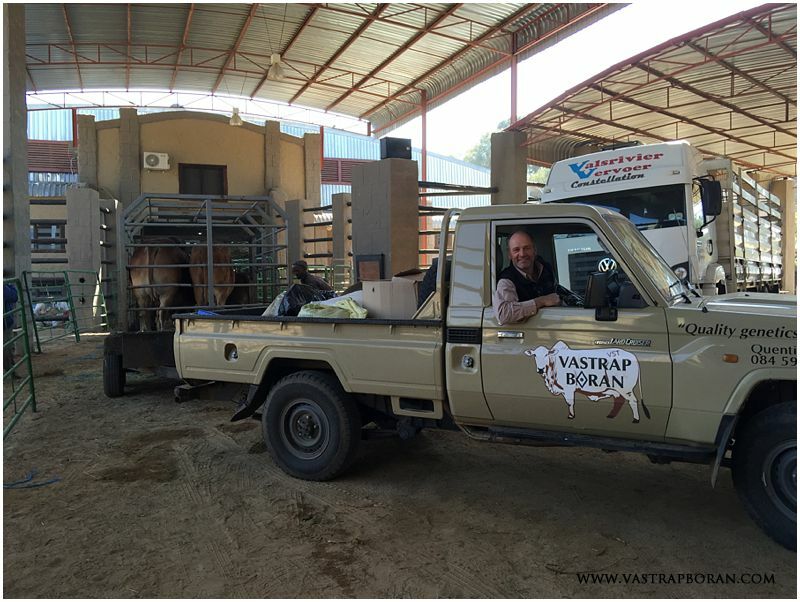 We were thrilled to purchase two great animals to join the Vastrap herd. A prospective stud sire, DVB 08-16, whose grandfather is 2738 and on the dam side has 494 and HVT 95-03 (R70’000). 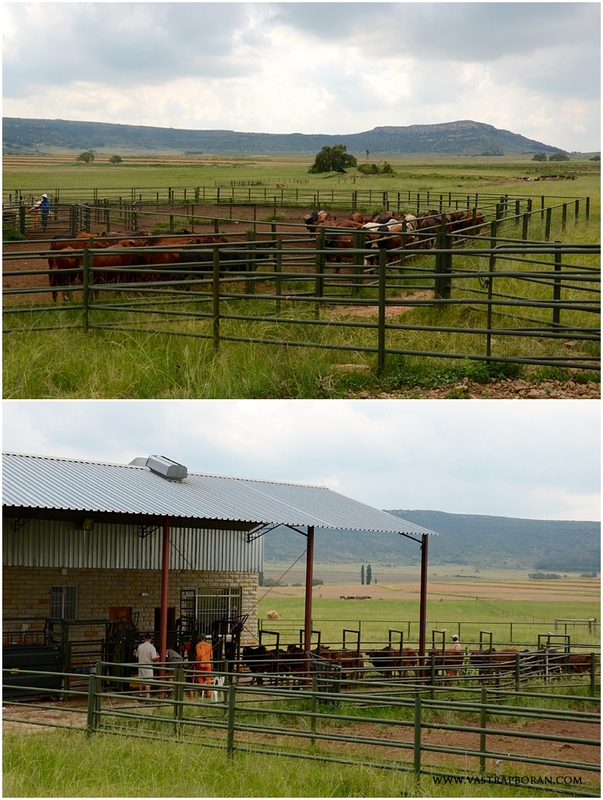 We also bought, JH 07-08, which has HVT 95-03 as her grandfather and KPO 791 on her dam side (R35’000). 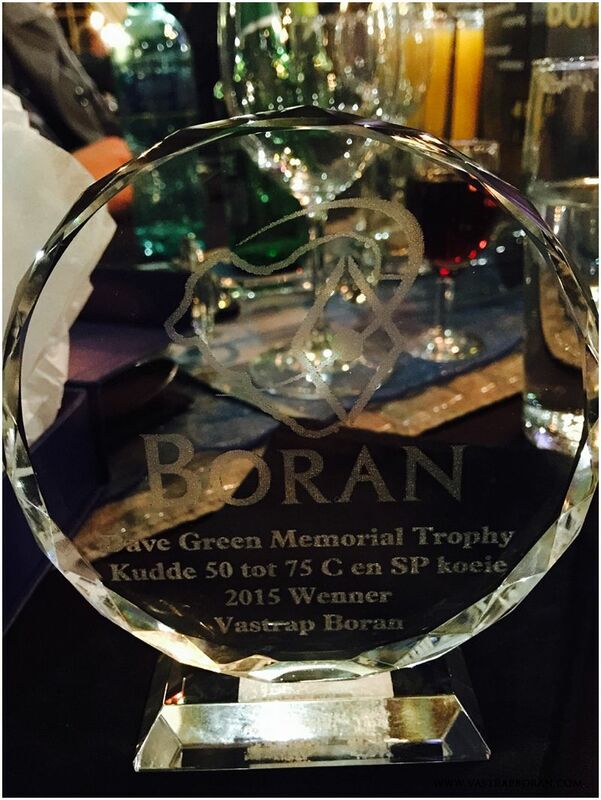 The biggest surprise for us, was that Vastrap was awarded the Dave Green Memorial trophy for the best managed medium-sized Boran herd in South Africa! We really weren’t expecting any prizes, but it is fantastic to be acknowledged and to know that our work is paying dividends. 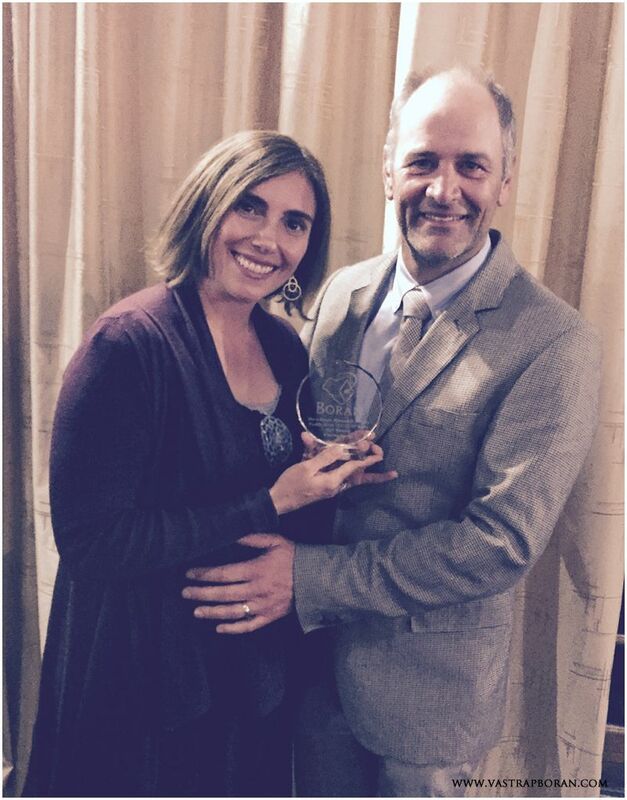 The award not only celebrates the animals, but also gives credit for good administration and data capturing, which is one of the things we focus a lot of effort on. The award is based on performance in a number of quantitative indicators. A third of the scoring is for data capturing (birth, weaning, 12 & 18 month weights) and the percentage of bulls that participate in phase D performance tests. 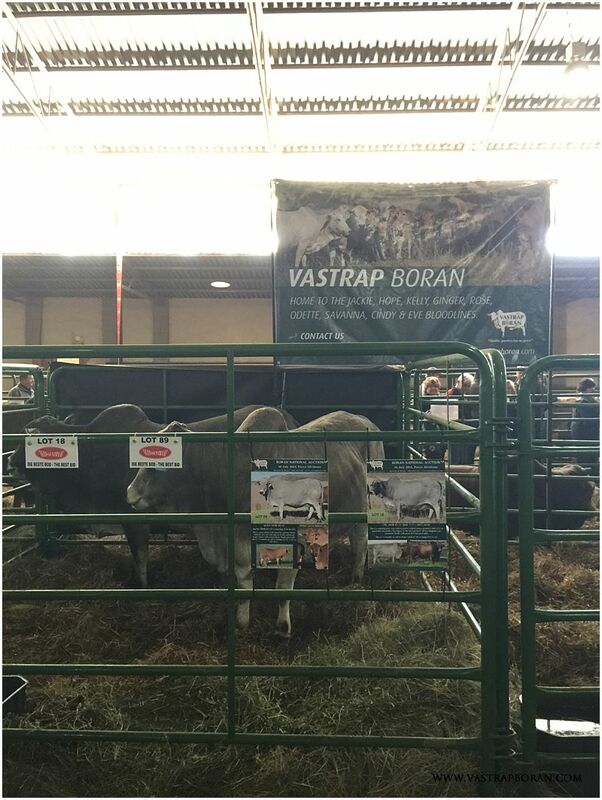 Vastrap bulls account for a third of all Boran bulls in Studbook’s official performance tests each year. 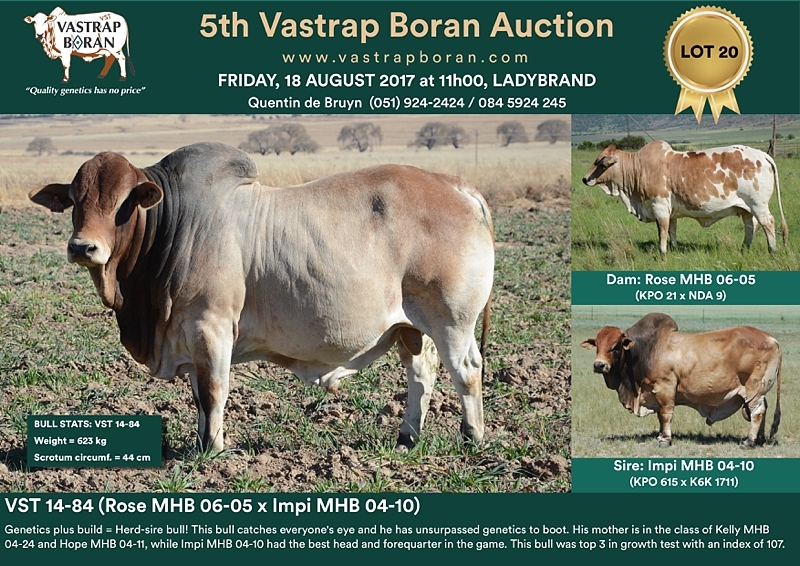 This data plays a very important role in our selection of bulls for the annual Vastrap Auction, which will be held on 14 August (see 2015 Vastrap Boran Auction). The rest of the scoring is based on the size of the herd, inter-calving performance, age of first calf of herd and days since last calving. We have been very blessed to have exceptional fertility in our herd over the past year. There are many things one can do to improve performance in this area to achieve consistently good results, but a lot of it is also down to weather and grazing conditions. There is no doubt that we have been blessed and we are extremely grateful to have these wonderful animals in our daily lives. This week we were visited by Siebert and Gerdus from Studbook who took measurements of our bulls for performance testing. 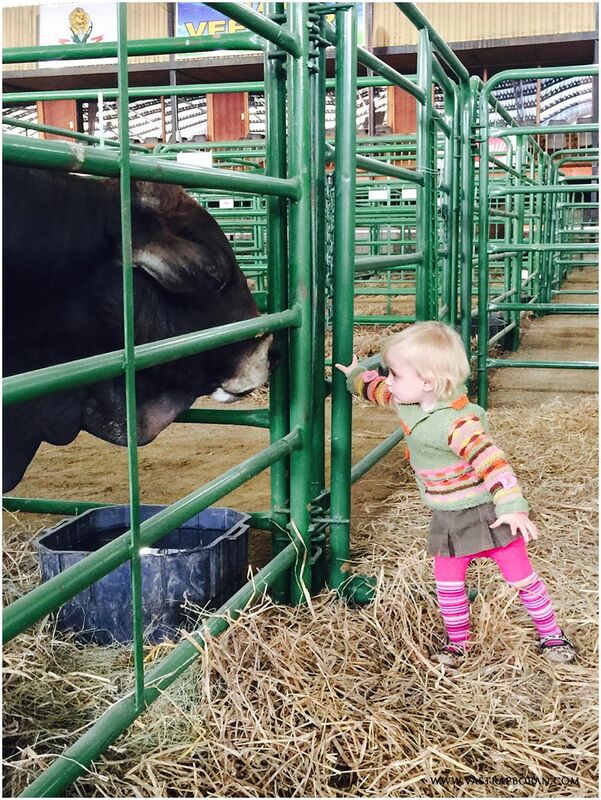 Performance tests are an important complement to other criteria in our bull selection. We believe that rigorous selection criteria, which includes performance testing contributes to the betterment of the Boran breed. The tests allow us to rank each bull against its peers using a range of calculations derived from measurements of average daily weight gain (measured over 6 months); fat layering on the rump and rib; marbling on the sirloin and sirloin size; length and height of animal; skin thickness and scrotum circumference. 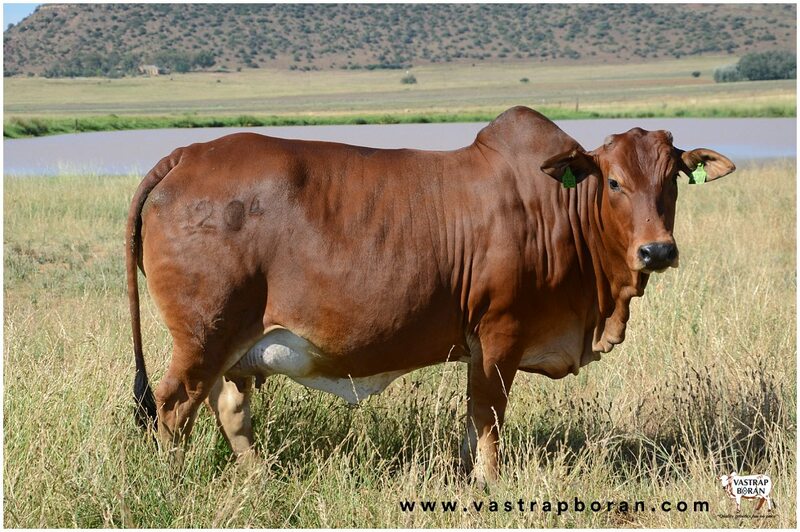 At the 2016 Vastrap Boran Auction we will be offering 20 of our best 3-year old bulls. These bulls will go through a three-step process of evaluation. First, inspection by the Boran society. Second, a more detailed inspection and grading by a group of fellow Boran breeders, and lastly the performance testing. After each evaluation round the poorest performers are slaughtered and only 20 of the top performing bulls from a group of 50 will be offered at the auction. By doing this we endeavour to provide bulls that will be good ambassadors for both Vastrap Boran and the Boran breed as a whole.